Background Acute variceal bleeding (AVB) requires early therapeutic management by experienced endoscopists that often poses logistical challenges for hospitals. We assessed a different management concept with early application of haemostatic powder—which does not require high endoscopic expertise—added to conventional management in a randomised trial. Methods Cirrhotic patients with AVB received standard medical therapy and were randomised to either immediate endoscopy with haemostatic powder application within 2 hours of admission, followed by early elective endoscopy on the next day, that is, within 12–24 hours of admission for definitive treatment (study group) or to early elective endoscopy only (control group). In both groups, failures to achieve clinical haemostasis until the time of early elective endoscopy underwent rescue endoscopy with attempted conventional haemostasis. Primary outcome was endoscopic haemostasis at the elective endoscopy. Results Of 86 randomised patients with AVB, 5/43 in the study group required rescue endoscopy for failure of controlling spurting bleeding (n=4) after powder application or for early bleeding recurrence in one patient who died before repeating rescue endoscopy. In the control group, 13/43 patients required rescue endoscopic haemostasis for failure of clinical haemostasis (12%vs30%, p=0.034). 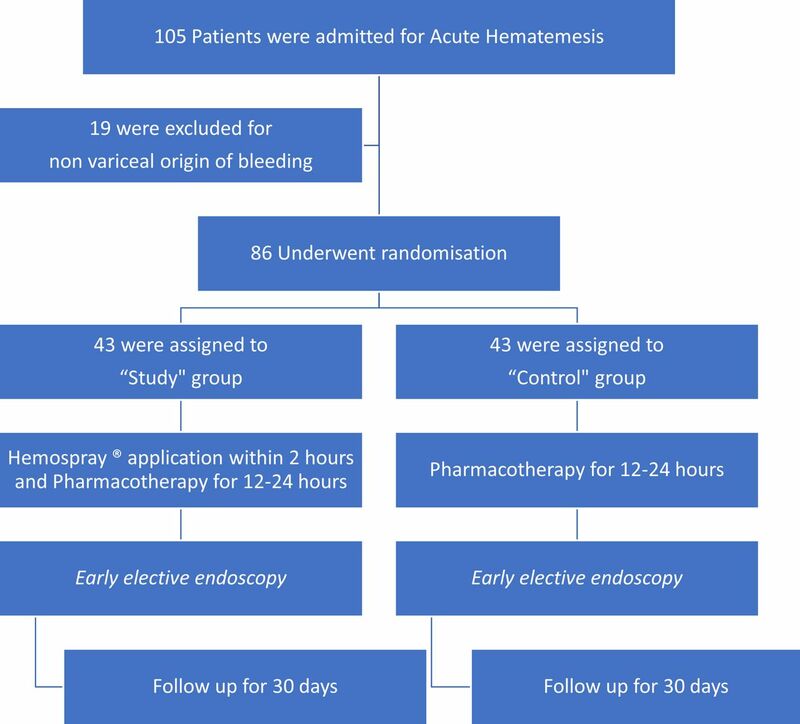 In the remaining patients, early elective endoscopic haemostasis was achieved in all 38 patients in the study group, while all remaining 30 patients in the control group had fresh gastric blood or (10%) spurting bleeding at early elective endoscopy with successful haemostasis in all of them. Six-week survival was significantly improved in the study group (7%vs30%, p=0.006). Conclusion The new concept of immediate powder application improves early clinical and endoscopic haemostasis. This simplified endoscopic approach may have an impact on early and 6-week survival. Acute variceal bleeding (AVB) is the most life-threatening complication of liver cirrhosis and associated with increased mortality. Combined treatment with vasoactive drugs, prophylactic antibiotics, and endoscopic techniques is the recommended standard of care but requires considerable endoscopic expertise. TC-325 is a haemostatic powder which, when put in contact blood or tissue in the GI tract, becomes adherent to the bleeding site, achieving very rapid haemostasis. Early (2 hours) haemostatic powder application on actively bleeding varices improves clinical and endoscopic haemostasis in patients admitted with a first episode of AVB. There is a significant improvement in survival at 6 weeks in the powder group compared with the pharmacotherapy–endotherapy group, although this was not the primary endpoint of the study. Endoscopic powder application, an easy procedure requiring minimal expertise, shows clinical benefit when performed early after admission of a cirrhotic patient with a first episode of AVB and overt haematemesis. This new concept might improve management of these patients, particularly when admitted in centres where advanced endotherapy is not available 24/7. TC-325 (Hemospray, Cook Medical, Winston-Salem, North Carolina, USA) is a haemostatic powder which, when put in contact with moisture (eg, blood or tissue) in the GI tract, becomes cohesive and adhesive forming a mechanical barrier that adheres to and covers the bleeding site, achieving very rapid haemostasis.11 After approximately 24 hours, the adherent layer subsequently sloughs off into the lumen from the mucosal wall and is eliminated from the GI tract.11 Using a delivery system dedicated to endoscopic applications, it has been shown to be effective in peptic ulcer bleeding,11 12 including high-risk patients13 on anticoagulant or antithrombotic therapy,14 those with tumour-related bleeding15 and patients with lower GI bleeding.16 In two pilot studies17 18 and two case reports,19 20 Hemospray was reported to be useful in emergency management of AVB as an added treatment modality to the medical management that serves as a bridge towards more definitive endotherapy, with no major adverse events or device-related mortalities. As such, this therapy offers an interesting option for transient haemostasis that does not require specific expertise in therapeutic endoscopy. The present randomised controlled study aimed to determine whether a new approach to AVB, namely the addition of an early and easy to perform treatment with haemostatic powder to classical medical and endoscopic therapy can improve outcomes in patients presenting with liver cirrhosis and a first episode of severe AVB. Patients were enrolled at two tertiary centres (Erasme University Hospital, ULB, Brussels, Belgium and Theodor Bilharz Research Institute, Giza, Egypt) between November 2014 and November 2016. Eligible patients were over 18 years of age with proven AVB and liver cirrhosis who presented to the outpatient emergency room. Exclusion criteria included patients already hospitalised at the time of bleeding, contraindication to endoscopy, pregnant or lactating women, patients with altered postsurgical anatomy of the stomach, previously placed intrahepatic portosystemic shunt and patients treated by other endoscopic or surgical modalities within 30 days prior to the intended inclusion in the study. All patients provided written informed consent. The study protocol was registered at Clinicaltrials.gov under the number NCT03061604. Immediate endoscopy for Hemospray application (in the study group only) was defined as endoscopy within 2 hours with attempted universal Hemospray application. Early elective endoscopy on the next day, that is, with 12–24 hours was defined as endoscopy to achieve haemostasis by specific endoscopic therapy such as banding or cyanoacrylate injection. This was performed in all patients in both groups on the next day, if clinical haemostasis could be achieved in the time until then. Rescue endoscopy in the study setting was defined as an early emergency endoscopy within 60 min in patients in whom either Hemospray or medical management could not achieve clinical haemostasis. This endoscopy included specific therapeutic measures as described for early elective endoscopy. Rescue endoscopy was done (A) in the study group, either during immediate endoscopy when Hemospray could not achieve haemostasis or after initial Hemospray with haemostasis but recurrent overt bleeding before early elective endoscopy within 12–24 hours and (B) in the control group if medical management was not able to bridge the time until early elective endoscopy. Clinical haemostasis was defined as a haemodynamically stable patient (ie, the systolic blood pressure >80 mm Hg and heart rate <100 beats per minute) without overt bleeding or haemostasis in whom rescue/emergency endoscopy was considered not to be indicated and who could be endoscoped on the next day, that is, within 12–24 hours. Rebleeding during the first 12–24 hours of admission was manifested by acute haematemesis or a combination of decreased blood pressure (systolic blood pressure under 80 mm Hg), increased heart rate (more than 100 beats per minute), transfusion need (requirement of 4 units of blood or more) and haematocrit drop (more than 10%). Thus, failure of clinical haemostasis was defined in the study group as either failure of Hemospray to achieve haemostasis during immediate endoscopy or recurrent bleeding, thereafter necessitating rescue endoscopy before early elective endoscopy. In the control group, failure was defined as necessity to perform rescue endoscopy before early elective endoscopy. Endoscopic haemostasis was defined as no active bleeding and no blood in stomach at the time of the early elective endoscopy (defined based on the BAVENO criteria)6 in both groups. The flow chart of the study design is shown in figure 1. Gastric lavage using a soft 14 French nasogastric tube was done for all patients at admission. This measure is still controversially discussed in the literature21; however, in our experience, it helps in the clearance of the blood from the fundus of the stomach and hence facilitates assessment and management of the bleeding source especially in gastric varices. Acute bleeding was confirmed by the presence of fresh blood in the stomach. Drug therapy was administered in both groups: treatment with vasoactive drug (octreotide) was started at admission and continued until patients were free of bleeding for at least 24 hours after the early elective endoscopy in both groups. Octreotide (Sandostatin, Sandoz International GmbH, Germany) was administered at a dosage of 50 µg bolus at admission then 25 µg/hour for 24 hours after the early elective endoscopy. Study group: Hemospray application during an immediate endoscopy within 2 hours with application of Hemospray in all cases (except for those with non-variceal bleeding sources who were excluded), followed by early elective endoscopy on the next day, that is, within 12–24 hours. Control group: only drug therapy on admission, followed by early elective endoscopy on the next day, that is, within 12–24 hours. For obvious ethical reasons, rescue/emergency endoscopy with targeted haemostasis was performed in patients who failed to achieve clinical haemostasis (in both groups) before elective endoscopy or in whom spurter bleeding was not controlled by powder application (these were also censored as failure of clinical haemostasis; see below). The randomisation sequence was generated with the use of a concealed block size of four. The coded treatment assignments were kept with the study coordinator at coordinating centre in sealed, consecutively numbered, opaque envelopes. Randomised assignments to the study groups were made by contacting the coordinating centre (available 24 hours a day) by telephone or fax. There were no changes that have been made to the trial design after commencement. Blood volume replacement was initiated with plasma expanders, aiming to maintain a systolic blood pressure of around 100 mm Hg. A restrictive packed red blood cell transfusion strategy was used following BAVENO criteria.6 Therapy with octreotide is described above. All patients received cephalosporin (ceftriaxone 1 g intravenously once daily) for 7 days. The definitive endoscopic therapy (early elective endoscopy, 12–24 hours after admission) consisted of endoscopic band ligation (EBL), in cases of oesophageal varices, and/or N-butyl-2-cyanoacrylate injection (Glue) in cases of gastric varices. EBL was performed with the use of multiband devices (Cook Medical). Glue injection was performed using a mixture of 0.5 mL of cyanoacrylate with 0.5 mL of lipiodol and repeating intravariceal injections of 1.0 mL using a 21 G needle (Cook Medical; MTW, Dusseldorf, Germany) until haemostasis was achieved. The device used for powder application consists of a 10 French application catheter, which passes through the working channel of a therapeutic gastroscope, a chamber containing approximately 21 g of TC-325 powder and a propellant CO2 canister. A therapeutic scope (3.8 mm working channel, EC-600W, Fujifilm, Tokyo, Japan or Olympus GIF 1T190) was used in all patients. After confirmation of AVB, which was defined based on the BAVENO criteria (actively bleeding varices or fibrin plugs and/or red streaks of the mucosa overlying the varices with presence of fresh blood within the lumen), a bleeding site that encompassed the definitive or most probable source (oesophageal or gastric varices) was identified. The haemostatic powder was then administered diffusely to cover the mucosa over the bleeding varices area to obtain immediate endoscopic haemostasis. In case of spurter bleeding, the bleeding site was observed for 3 min under endoscopy. If bleeding recurred during this 3 min observation period, Hemospray was reapplied once. If after three more minutes bleeding recurred, this was considered as treatment failure and, for obvious ethical reasons, conventional endoscopic therapy (with cyanoacrylate injection) was successfully applied during early endoscopy. Patients were censored as treatment failures and failures of clinical haemostasis, even if none of them presented with rebleeding during the next 24 hours, and were excluded from the mortality analysis in a subgroup survival analysis. Follow-up of patients was done at 1, 2 and 5 days, and follow-up visits were scheduled on day 15 and day 30 of first admission, where clinical assessment was done in combination with endoscopic therapies, if indicated. The primary study endpoint was a combined endpoint of endoscopic haemostasis at conventional endoscopy performed at 12–24 hours and clinical haemostasis during the 24 hours following admission. Secondary endpoints were the need for immediate emergency endoscopy, rebleeding at 5 days and survival at days 5, 15, and 30. Subanalysis were asked for reviewing, namely spurter bleeding rate during early elective endoscopy and 6-week mortality. The sample size was calculated with the reference to the pilot study conducted on the effect of addition of Hemospray on the conventional standard of care (SOC)19 and literature-based studies21 that tested SOC in AVB. We assumed in our population receiving pharmacotherapy and endotherapy a 75% rate of haemostasis at 5 days based on results of previous meta-analyses.21 22 Based on the results of two pilot studies18 19 that assessed the addition of Hemospray to drug therapy and endoscopic therapy, we hypothesised that the rate of haemostasis would increase to 96% when Hemospray was added to standard therapy at 2 hours after admission. A sample size of 43 patients in each group was assumed to allow for a confidence level (1-α) of 95% and a study power (1-β) of 85% to guarantee such results. All data analyses were performed on an intention-to-treat basis according to a pre-established analysis plan. Dichotomous variables were compared by means of Fisher’s exact test, and continuous variables were compared by means of the non-parametric Mann-Whitney rank-sum test. Survival was estimated by the Kaplan-Meier method, and groups were compared by means of the log-rank test. A p value of less than 0.05 was considered to indicate statistical significance, and all tests were two sided. The statistical software package used for the analysis was SPSS (V.20.0). One hundred and five patients with acute haematemesis who were admitted to one of the participating hospitals (Erasme Hospital, ULB, and Theodor Bilharz Research Institute) were included in the study. A total of 19 patients were excluded at the time of endoscopy due to non-variceal causes of bleeding (figure 1), and the remaining 86 patients (1 patient in Erasme Hospital, ULB, and 85 patients in Theodor Bilharz Research Institute) were randomly assigned to either the pharmacotherapy–endotherapy group (43 patients) or the powder group (43 patients). There were no significant differences in baseline characteristics between the two groups at the time of entry into the study (table 1). In this group, at the time of Hemospray application, all patients had active bleeding with fresh blood in the stomach and seven of them showed spurting bleeding. Five patients did not achieve clinical haemostasis after the Hemospray application. For four of them, definitive endoscopic management was applied directly after failure of Hemospray as mentioned: they were treated by classical endotherapy despite the absence of relapsing overt haematemesis and censored as clinical haemostasis failures and were excluded from the mortality analysis in a subgroup survival analysis. One patient had a relapsing haematemesis 2 hours after Hemospray with overt hepatic encephalopathy, and death before immediate urgent endoscopy could be performed and before elective endoscopy at 12–24 hours. The remaining 38 patients achieved clinical haemostasis after Hemospray application and early elective endoscopy (performed at a median of 18 hours (range 12–24 hours after admission) demonstrated endoscopic haemostasis in all of them (no active bleeding and no fresh blood in the stomach) before performing treatment with EBL in 24 patients, glue injection in 5 patients and combined techniques in 9 patients. Flow chart in figure 2 describes the overview of both groups in the first 5 days. In this group, 13 patients did not achieve clinical haemostasis due to a second attack of overt haematemesis within the first 12 hours before the early elective endoscopy and required an immediate rescue/emergency endoscopy. Five of them had spurting bleedings at the time of rescue endoscopy and fresh blood in the stomach was observed in all patients. Band ligation was applied in eight patients, and combined EBL and glue injection for gastric varices was applied in five patients. All targeted haemostasis was successful. The remaining 30 patients underwent their early elective endoscopy as planned at a median of 16 hours (range 12–24) after admission. All 30 patients had active bleeding at the time of endoscopy, either fresh blood into the stomach (n=27) or spurting bleeding (n=3). EBL was performed in 22 patients with oesophageal varices; four patients had isolated gastric varices treated by glue injection and four patients had both oesophageal and gastric varices treated by EBL and glue injection with therapeutic success being achieved in all patients. Figure 2 provides an overview of both groups in the first 5 days. Overview of both groups in the first 5 days. This overview on results combines the rebleeding and emergency endoscopy rates within 5 days of admission, that is, before the early elective endoscopy (within 12–24 hours) and thereafter. In the control group, treatment failure at 5 days, that is, rebleeding, was observed in 16 patients (13 early, within the first 12 hours as described above, and 3 after the elective endoscopy within the first 5 days), and these were treated by additional EBL and/or glue injection. In the study group, five patients had rebleeding within the first 12 hours (four of them during the Hemospray endoscopy, immediately treated as described above and one within the first 12 hours) and none had rebleeding later after elective endoscopy, within the first 5 days (table 2). A total of 13 patients in the control group died within the first 6 weeks with 1 patient lost to follow-up, while 3 patients died in the study group. Survival at 5, 15 and 30 days is shown in figure 3. Causes of death are summarised in table 3. A trend for more positive blood cultures at admission was observed in the control group as compared with the study group at admission (table 1), but a subgroup analysis of mortality at 6 weeks among these patients showed a similar number of deaths in both groups. A flow chart summarising mortality in line with clinical and endoscopic haemostasis is presented in figures 4 and 5. Interestingly, most of the deaths (12/13) and all delayed rebleeders (6/6) at 6 weeks in the control group were from the subgroup of 30/43 patients who achieved clinical haemostasis with drug and medical therapy before early elective endoscopy. 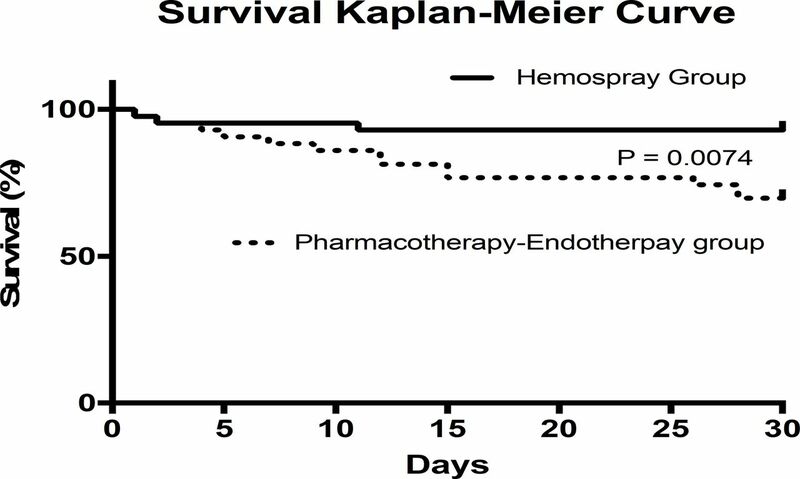 Kaplan-Meier survival curves at 5, 15 and 30 days for patients treated with Hemospray plus pharmacotherapy and endotherapy (Hemospray group) or with pharmacotherapy and endotherapy alone (pharmacotherapy–endotherapy group). Flow chart summarising rebleeding in line with clinical and endoscopic haemostasis. Flow chart summarising mortality in line with clinical and endoscopic haemostasis. Twenty-three patients experienced 36 adverse events, 16 of them died within the first 6 weeks (table 4). No adverse event was related to the powder application. The current study shows that in patients with cirrhosis admitted for a first episode of AVB with overt haematemesis, a novel approach consisting in a very early application of a haemostatic powder in addition to standard pharmacotherapy and endotherapy significantly reduces clinical rebleeding within 24 hours compared with standard pharmacotherapy plus endotherapy alone. This easy-to-perform procedure does not require the usual endoscopic expertise needed for bleeding management. 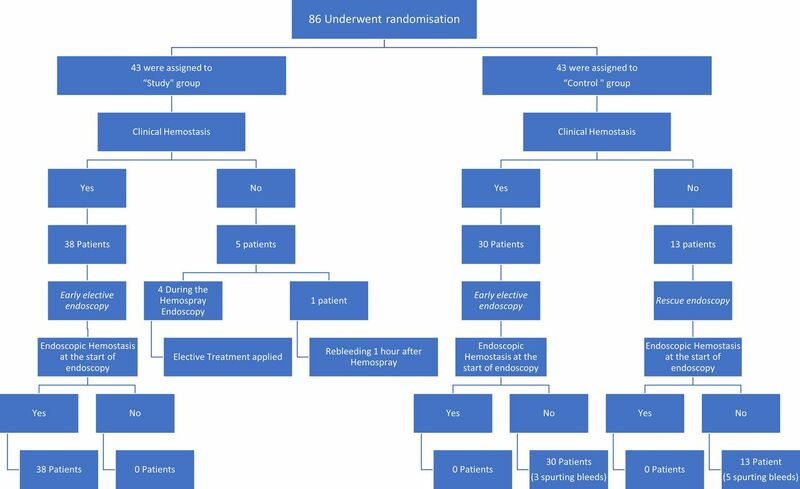 Furthermore, all patients who received haemostatic powder therapy and did not have early clinical rebleeding achieved endoscopic haemostasis prior to elective endotherapy. This study also suggests that this early procedure may have an impact on survival at 6 weeks and 30 days by decreasing early and late rebleeding and its associated complications and by providing a more effective early haemostasis than pharmacotherapy. However, the study was not powered for survival, and therefore these results should be viewed with caution and should be confirmed by further randomised trials. Nevertheless, the concept that (very) early successful haemostasis may have an influence on final outcome with regards to survival is an interesting one and should prompt further research. It must be mentioned, however, that Hemospray application is considered a temporary haemostatic measure and should not obviate the use of later (early) elective endoscopy to apply specific endoscopic measures for bleeding control and variceal eradication. In our study, it appeared that this effect lasted for 12–14 hours until early elective endoscopy was scheduled. The timing and required expertise of endoscopic haemostasis in AVB has been a topic of discussion that has recently been revitalised with the availability of effective vasoactive pharmacotherapy, also leading to reconsidering the availability of endoscopic expertise. The current recommended therapy for AVB combines vasoactive drugs from admission with endoscopic therapy within 12 hours plus prophylactic antibiotics.7 23 Only the availability of both an on-call experienced GI endoscopists proficient in endoscopic haemostasis and support staff with technical expertise in the usage of endoscopic devices enable high-quality performance of endoscopy on a 24/7 basis.21 In a study by Cheung et al,22 the optimal timing of endoscopy in AVB was evaluated. They compared different timeframes for endoscopy (≤4 hours vs >4 hours, ≤8 hours vs >8 hours and ≤12 hours vs >12 hours) and reported no difference in mortality and rebleeding rates. However, they also showed that significantly more bands were used to stop active bleeding in the group treated within 4 hours. This observation aligns with the recommendation to have an experienced endoscopists available at the time of band ligation, something which is not always possible before 24 hours.10 The availability of a simple endoscopic haemostatic technique that could be performed even by physicians with basic expertise in endoscopy might allow us to revisit the current treatment recommendation if it was associated with improved outcomes. The application of Hemospray only consists of spraying powder into the upper GI tract from the upper part of the stomach up to the mid-third of the oesophagus and requires only limited experience in this indication. This study was designed to test whether this powder application, when performed very early after admission, can improve the outcome for patients with variceal bleeding. Even after considering as failures those patients for whom bleeding was not controlled by powder endoscopy during early endoscopy, and for whom, in our environment, it was considered unethical not to perform classical haemostasis during the same procedure, we observed a significant reduction of clinical rebleeding during the first 24 hours. Besides that, all the patients who had received previous powder application were treated with band ligation and/or glue injection in the absence of endoscopic bleeding and in a hemodynamically stable condition, a feature that was proven to be beneficial in terms of prognosis and mortality.7 Thus, in an unexperienced setting as described, the concept of early powder application would not have worked in 5/43 cases (four during and one after the early endoscopy with powder application), all or some of whom should be strictly speaking considered as failures in this concept in which no experienced endoscopist is available. For ethical reasons we treated these four cases with immediate powder failed also immediately by targeted endoscopic therapy which was successful in all cases. This must be considered as limitation of this concept with some 10% of failures that would have been benefited from the presence of an experienced endoscopist. Whether a less experienced endoscopists would have been able to manage these cases as well during the night can only be speculated on. For the study outcomes and under worst case assumptions, that is, counting all four immediate failures under mortalities (the fifth failure patient died anyway), mortality rates would still be different (7/43 vs 13/43) but not significant any more with the case numbers chosen for the primary outcome. This, however, is entirely speculative and only shows the limitations of dealing with a secondary outcome, which did not influence case number calculation. In our study, drug administration alone did not provide full endoscopic haemostasis: 10% of patients still had spurting bleeding at early elective endoscopy, and all patients in whom clinical haemostasis was achieved (ie, haemostasis from a clinical standpoint not necessitating earlier rescue endoscopy) still had fresh blood in the stomach at early elective endoscopy (performed within 12–24 hours). In contrast, all patients remaining in the powder group, after exclusion of the five patients who underwent immediate urgent endotherapy and the one who had clinical rebleeding and died after powder application, showed maintained endoscopic haemostasis (no spurting bleeding and no fresh blood into the stomach) at the start of elective endotherapy. This raises some interesting questions with regards to full (endoscopic) versus partial (clinical) haemostasis and their influence on outcome. It could be speculated that, even if clinical haemostasis is achieved on drug therapy, there is ongoing low-level bleeding until early elective endoscopy. Early cessation of bleeding (which occurs much earlier after powder application in our management concept) could be a feature possibly associated with overall better outcomes. Although the risks of treatment failure and death were higher in patients with Child-Pugh class C disease than in those with class A and B disease, our trial was not powered to conduct appropriate subgroup analyses. Therefore, further evaluation will be needed to determine whether the use of Hemospray equally benefits these subgroups of patients. It is, however, notable that no mortality was observed among child A and B patients in the powder group. Previous studies evaluating the role of powder application in non-variceal bleeding and in AVB demonstrated its efficacy for transient control of bleeding and haemodynamic stabilisation. It has always been recommended mainly as a rescue therapy. This restriction is obviously challenged by the present study where early haemodynamic stabilisation using an easily applied technique affected the development of additional complications in these frail patients and, therefore, overall patient outcomes, as shown by potentially reduced mortality. Moreover, early haemodynamic instability is a well-known factor affecting the development of complications and mortality in cirrhotic patients with AVB.9 27 In this line, it is of interest to notice that most of the mortality in the control group (12 out of 13 patients who died within 6 weeks) occurred in patients who did not require (or benefited from) immediate emergency endoscopy with targeted haemostasis for failure of clinical haemostasis within the first 12–24 hours after admission until early elective endoscopy. However, also other reasons for these differences in survival outcome—unusual in studies in endoscopic variceal haemostasis—should be considered and be the topic of further research. Survival was however not the primary endpoint of this study, and sample calculation was not made with this purpose. In addition, although not significant, there was an inhomogeneity in the number of patients with a documented bacteraemia within 2 hours after admission, which might have affected our results. However, subgroup survival analysis—if possible in this limited patient sample—did not show significantly different mortality rates in patients with positive blood cultures between both groups. The limited sample size—based on the primary outcome—is a limitation of our study with respect to further analyses. Furthermore, the study was almost unicentric, since all but one patients were recruited in one centre due to the much larger case load of acute variceal bleeders as well as patients in Europe usually receive primary endoscopic management in community hospitals where the issue of proper endoscopic expertise for treating severe bleeding in unstable conditions is precisely the problem addressed by the current study. Thus, it might be worthwhile to repeat this study in a true multicentre setting and also with endoscopists of different experience levels. There are also other limitations of this study: transjugular intrahepatic portosystemic shunt (TIPS) was not offered to child B and C patients. There is no direct comparison between early EBL and early Hemospray. Although the risks of treatment failure and death were higher in patients with Child-Pugh class C disease, our trial was not powered to conduct appropriate subgroup analyses. Therefore, further evaluation will be needed to determine whether the early use of Hemospray followed by TIPS equally benefits this subgroup of patients. To date, the commercial use of Hemospray is restricted to non-variceal bleeding mainly because of the theoretical fear of systemic embolisation similar to that complicating cyanoacrylate injection.28 The current application in AVB is a non-contact technique where the above risk is most probably non-existent due to the fact that the pressure of powder delivery, even at the tip of the catheter is only around 12 mm Hg,29 30 that is, below the variceal pressure in most cases. In this series, no complications related to the powder itself were observed. In summary, our study introduces a new concept of early, simple, therapeutic procedure that might be offered in places where expertise in endoscopic therapy is not available 24/7 and that would allow to safely bridge to more definitive therapy with a potential effect on overall outcomes (including mortality), the latter still having to be confirmed. We would like to thank Dr T Gustot and Dr C Moreno from the Hepatology Unit, Erasme Hospital, for their input about the defect in the literatures, which developed the study question. We would like to thank Dr O Le Moine, Erasme Hospital, for his advice and help regarding the sample size calculation. We would like to thank Dr R Talaat, IPSOS MENA, for his advice regarding the statistical analyses. Contributors MI was responsible for the study design, acquisition of data, analysis and interpretation of data, drafting of the manuscript, technical support and material support. AE-M, HA, AL and MAH were responsible for acquisition of data and technical support. IM was responsible for the study supervision. JD was responsible for study design, interpretation of data, statistical analysis, study supervision and final revision of the manuscript. Competing interests The study is an investigator-initiated study, MI received an educational grant from Cook Medical. The Hemospray kits were provided from Cook Medical within the educational grant. Disclosure forms provided by the authors are available with the full text of this article.